Are you an Amazon Prime member? 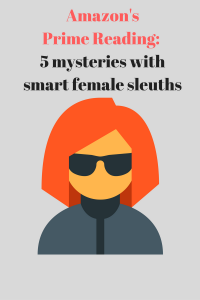 Do you love mysteries with smart, strong female sleuths? Then you’re in luck! Amazon’s new program, Prime Reading, now allows Prime members to download an unlimited number of Kindle books from a rotating selection of thousands of highly rated titles—FREE! Currently, there are nearly 200 mystery and thriller titles to choose from. Here’s some help narrowing down your choices if you like a good twisty plot and strong, smart, well-developed characters. Take advantage of your Prime Reading benefits and download one–or all–of these great mysteries, all rated 4.2 stars or above. Another Man’s Treasure—On a snowy Christmas Eve, a beautiful young mother goes out for a few last-minute gifts and never returns. Thirty years later, her daughter—an estate sale organizer—picks up the trail…with deadly results. Antiques Roadshow meets Law and Order in this tense romantic thriller. The Three Deaths of Magdalene Lynton—First her death is ruled an accidental drowning. Years later, a dying man comes forward and confesses to murdering her. But the facts don’t totally fit either scenario. Now Detective Constable Ngaire (pronounced Ny-ree) Blakes must solve the 40 year old cold case. Set in New Zealand! Mother’s Day Out—Stay-at-home-mom Margie Peterson takes a part-time job as a PI and finds herself knee-deep in murder and mayhem. This high-spirited romp is laugh-out-loud funny and more sophisticated than the standard cozy mystery. Circle of Bones—Former Marine Maggie Riley tries to sail away from a troubled past but steers her sailboat straight into a political conspiracy and a Caribbean treasure hunt. The author captains her own sailboat. The Shark—Virginia State Trooper Riley Tatum is caught up in a cat-and-mouse game with a serial killer who haunts her past and threatens her future and the safety of her teenage foster daughter. © 2019 SWHubbard. All Rights Reserved.